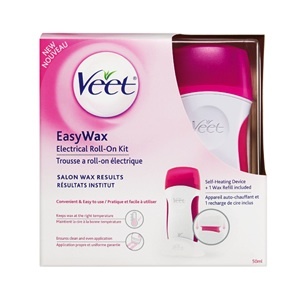 Get 5X the shoppers points when you purchase any Veet hair removal product at Shoppers Drugmart. This is an in store promotion and you don’t need any coupon to show the cashier. You can also see all the other offers available at Shoppers Drug mart by visiting their website. If you log into your account you will see all your offers available at Shoppers. Veet promotion is valid in Shoppers Drug Mart locations across Canada. The offer expires Aug 9, 2013. There are additional savings which you can find on Brandsaver.ca. There are Veet coupons to save up to $10 on Veet hair removal products –here. Only thing is that I doubt you will receive the coupons from Brandsaver before the promotion is over. It takes about 3-4 weeks before you can get coupons from Brandsaver. So anyways if you have your Veet coupons already, you can use them here as well. If you have the $10 coupon to save on Veet Electric Roll on Kit, that would be great because if you purchase that you also get a bonus entry into Shoppers Dream Summer contest. You can see the contest details here. Veet® is the leading name in depilatory products with over 100 years of experience in developing safe, effective, hair removal products that are successfully used by over 30 million women across the world every year.